There are seven companies that manufacture bulbs for the dozens of projector brands, each has a way of marking their bulbs and those that sell to the aftermarket mark them differently. Philips are the largest bulb manufacturer and pioneered the technology. 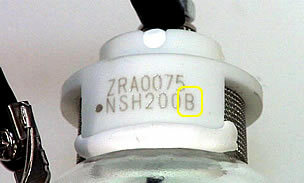 If the highlighted number is 90 or 91 or the letters ‘AM’ (aftermarket) are visible, this bulb was made for the aftermarket. 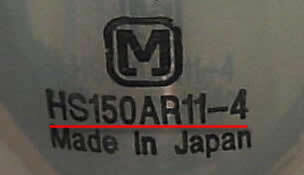 If sold as the projector manufacturer's original (OEM) it is a counterfeit. 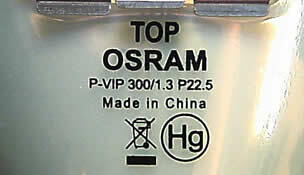 Osram are a top three, established bulb manufacturer. New Osram bulbs tend to have more information than old bulbs. Any data underlined in red on the old bulb should be seen on the new bulb*. Sometimes there is data on the bulb relevant to the projector manufacturer such as the text underlined in green. This should be identical between old and new bulbs. 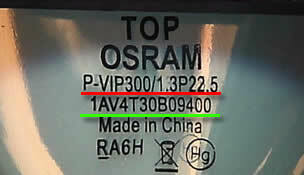 *Intellectual property is shared between Philips and Osram. 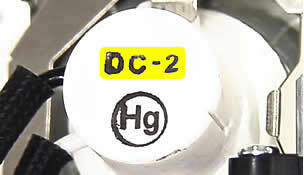 In a few instances the bulb brand may change between old and new, but the bulb markings must not display ‘Aftermarket’ codes. 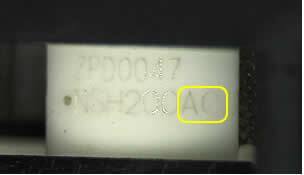 Osram used to mark their aftermarket bulbs with a small ‘a’ after the product code to differentiate them from OEM bulbs. However they have dropped this practice, thereby helping counterfeiters. It is therefore more difficult to differentiate between an OEM lamp and an aftermarket lamp and you would need to look at advanced identification. Ushio are also a major bulb manufacturer. 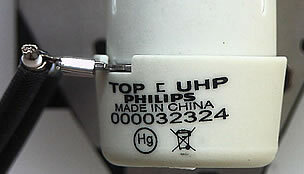 For Ushio, the manufacturer’s original lamp always shows a code such as the one underlined in red. The new lamp should have the identical code and it should always be printed in the same place*. 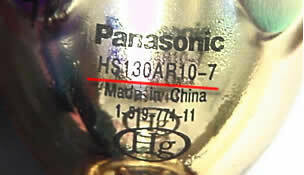 *Panasonic bought Sanyo so replacement bulbs ending ‘PA’ are correct replacements for bulbs marked 'SA'. After market lamps will have a similar code but after the numbers it will end in a single letter, A, B, C etc or it will end in two letter but the first will always be 'A', eg. AA, AB, AC etc. 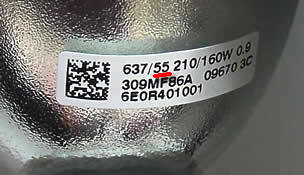 If these codes appear on a lamp sold as an OEM then that lamp is counterfeit. Epson make many of their own bulbs, but also buy from other manufacturers on this list. 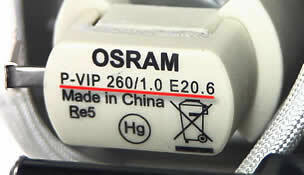 Epson only make bulbs for their projectors, so you will never see an Epson bulb in another projector. 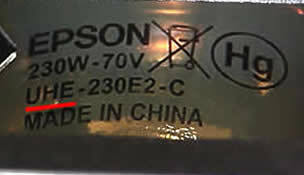 However Epson do buy bulbs from the other bulb manufacturers in this list and all bulbs in Epson projectors have the ‘UHE’ text that can be seen here underlined in red. Any variant to this should be treated as suspicious. Panasonic own the bulb brand name Matsushita and bought the projector brand Sanyo. Matsushita / Panasonic make bulbs for a number of OEMs and for themselves. The code underlined in red will be identical between the old and new bulb. If it is different then this is suspect and probably counterfeit*. 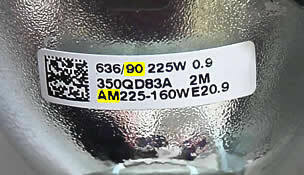 *Panasonic bought Sanyo so replacement bulbs ending ‘-4’ are correct replacements for bulbs that are marked '-6'. Phoenix are a specialist manufacturer. 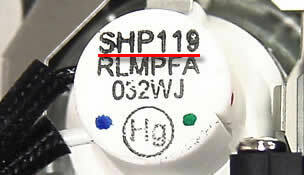 All Phoenix bulbs supplied in manufacturers original lamps have the code ‘SHP…’, underlined in red in the above picture. The replacement lamp should have the identical marking. All Phoenix bulbs made for the after market have a code such as the one highlighted in yellow above. The code will start either AX, DC, GL or SX followed by numbers. 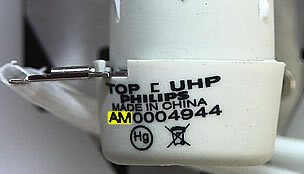 If this bulb is found in a lamp sold as an OEM replacement then it is counterfeit. Eye are a small manufacturer now. 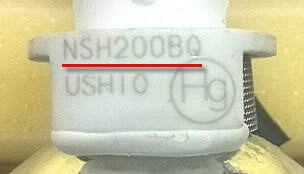 Iwasaki identify their bulbs with a code such as the one underlined in red above. 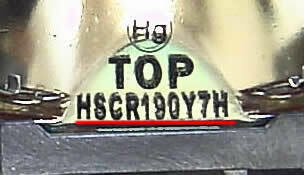 The code will start with the letters HSCR, MSCR or MSFR and the replacement lamp should have the identical marking. Tremendous effort has been invested in this page of information based on years of projector lamp experience talking to many manufacturers and literally handling a million lamps. Our belief is that all statement made on this page are accurate. If you represent a projector brand or bulb manufacturer and wish to clarify an item, error or omission on the page we would be very grateful for feedback. Please use the form in the lower right corner.